I forgive myself for accepting and allowing myself to turn my back on myself resisting myself in fear of what often feels like a storm brewing on the inside of me wherein fear I then sabotage intimacy with myself and in my relationships. I forgive myself for accepting and allowing myself since childhood to sabotage myself in fear anytime I’ve caught a glimpse of who I see I can be standing on my own accord. I forgive myself that I have accepted and allowed myself as a child to follow thoughts about myself not of/as making mistakes but of being a mistake. I forgive myself that I have accepted and allowed myself to as a child shame myself to such a degree that I acted out either in a grandiose manner and/or self-centered and selfless. I forgive myself that I have accepted and allowed myself to not see/realize and understand how as a child I assumed responsibility for the behavior of those around me, thus felt guilty and at fault when my parents argued yet, never realized how the acts of myself were distractions to not stand self-accountable and self-responsible for how I avoid intimacy with myself and intimacy with others. I forgive myself that I accepted and allowed myself to blame my family for what felt like storms within me where instead of letting go and letting me know me in self-intimacy, I suppressed myself through focusing on hiding for example behind clothing and/or make-up in an attempt to cover up flaws in my personal appearance of self. I forgive myself that I have accepted and allowed myself to feel constantly violated by others instead of realizing that it is only me as my mind who has violated me through my own participation in and as it directing me instead of me being the directive principle in self-honesty of and as me. I forgive myself that I have accepted and allowed myself to block feelings and emotions of shame toward myself through compulsive behaviors such as drug addiction, shoplifting, and gambling. I forgive myself that I accepted and allowed myself to not see/realize and understand that the way I’ve experienced myself has always been according to my lack of self-intimacy in how I avoid facing me. I forgive myself that I have accepted and allowed memories of myself as a child to still brew up storms within me as patterns and mind constructs as outflows of me where I resist physical intimacy within my current relationships. I forgive myself that I have accepted and allowed myself to not trust being intimate with my partner because I’ve never been intimate with myself. When and as I see myself living the outflow of a pattern as self-sabotage where within me are feelings like-a-storm brewing inside, I stop. I breathe. I realize that in the storm is where I avoid me in self-intimacy, thus, I slow myself down and allow me to remain here breathing as who I really am in the silence of me in self-honesty. I commit myself to face and forgive the outflows of me as memories from my past so as to stop the accumulation of my past as storms of me being walked in the present moment thus creating a lack of self-intimacy, thus I commit myself to breathing here in awareness of me as my physical body within and as this physical reality. 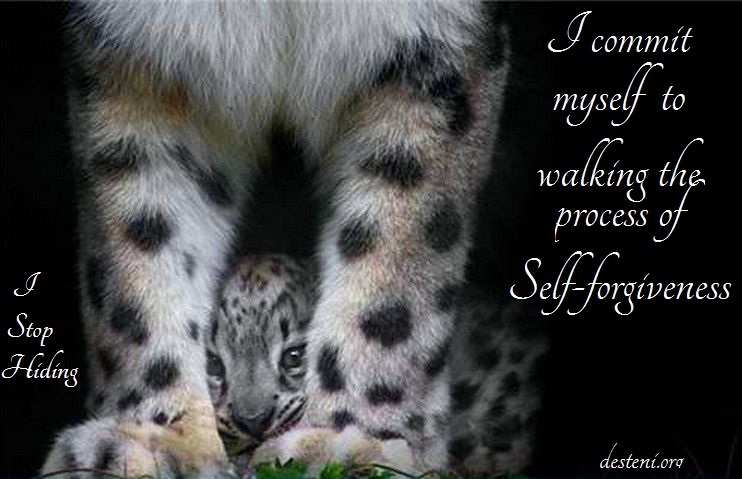 I commit myself to accept me within and as self-forgiveness. I commit myself to me in self-intimacy. I commit myself to willing myself to be gentle with myself and All living beings here. I commit myself to fully comprehending that this is my last life to assist myself to release myself from resistance and suppression which I’ve placed upon myself and to stand up for All living beings so that we can bring an end to our own self-abuse and emerge anew as life living the principle of equality. I forgive myself that I have accepted and allowed myself to experience anxiety within me within the urge to hide away into myself. I forgive myself for accepting and allowing myself to ‘feel’ embarrassed for having to push through the resistance of Not wanting to write within a desire to hide from myself. I forgive myself for accepting and allowing myself as a master in self-deception. I forgive myself for accepting and allowing myself to fear facing me. I forgive myself that I have accepted and allowed myself to live a pattern of hiding where I would withdraw from physical activity while I sat within my mind of thoughts on self-imposed pity pot. I forgive myself for accepting and allowing myself to resist coming out of hiding from the secrets of my mind. I forgive myself for accepting and allowing myself to be influenced by my mind’s protection mechanism of/as a listlessness mood. I forgive myself for accepting and allowing myself to become angry at myself for the evil I see I’ve been as my secret mind. I forgive myself that I have accepted and allowed myself to harbour feelings of self-hate towards myself. I forgive myself that I have accepted and allowed myself to pretend the doom in mood doesn’t belong to me when I am fully aware that it’s like an old friend who surprises you suddenly with their presence. I forgive myself that I have accepted and allowed myself to not take the point of wanting to hide seriously because I wasn’t willing to say goodbye to the oddly comforting feeling of myself hiding in pity and/or depression. I forgive myself that I have accepted and allowed myself to not realize that hiding within myself in self-judgment is self-abuse and self-denial. I forgive myself that I have accepted and allowed myself to use backchat as a method of hiding from self-responsibility. I forgive myself that I have accepted and allowed myself to hide what I’m actually experiencing inside from everyone, including myself, where I present myself as being strong and not struggling because in ego and fear I didn’t want to show any signs of weakness. I forgive myself that I have accepted and allowed myself to use as a protection mechanism my fear of being ridiculed so I push myself to be strong to survive, no matter what. I forgive myself that I have accepted and allowed myself to let resistance be the directive force of me – instead of me directing me in self-honesty. I forgive myself that I have accepted and allowed myself to be angry at myself for not realizing how I became a personality of my mind just to ‘fit in’ and ‘handle’ a situation – instead of breathing and directing myself in self-honesty. I forgive myself that I have accepted and allowed myself to not realize the self-denial of me in seeing that where there exists secrecy, there exists hiding. I forgive myself for accepting and allowing myself to complicate who I am in this moment in expectations of who I desire myself to be. I forgive myself that I have accepted and allowed myself to hide who I really am within secret mind thoughts of judging who I’ve been. I forgive myself that I have accepted and allowed myself to fear facing what I’ve allowed within my relationships with others, thus, fearing to see myself in others. I forgive myself for accepting and allowing myself to not realize that the desire to hide is just the negative end of the polarity pole with the positive being that of seeking. I forgive myself for accepting and allowing my mind to influence or control the words of me preventing me to see clearly my way to forgiving me. I commit myself to allowing myself to Stop hiding from myself in fear. I commit myself to allowing breath as an expression of/as me. I commit myself to accepting the simplicity of me. I commit myself to supporting a world where life comes out of hiding and assists one another to overcome our fears of each other. I commit myself to supporting an Equal Money system to educate the world that consciousness is Not who we really are.